Princess Elizabeth became Queen on February 6, 1952, after the death of her father, King George VI, yet the Coronation didn’t occur until 16 months later. Queen Elizabeth II was crowned on June 2, 1953, at Westminster Abbey, the setting for coronations for more than 900 years. The Queen, along with The Duke of Edinburgh, rode to the Abbey in the gold State Coach pulled by eight grey geldings. Her dress, designed by Norman Hartnell, was white satin embroidered with the emblems of the United Kingdom and the Commonwealth. She also wore the George IV State Diadem, which appears on many earlier stamps. During the ceremony, it was replaced with the solid gold St. Edward’s Crown, made in 1661. 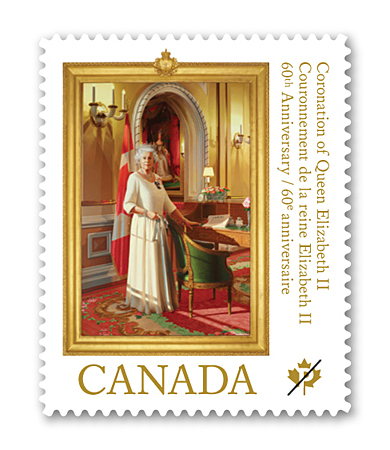 The portrait featured on this stamp was painted by noted Canadian artist Philip James Richards on the occasion of Her Majesty’s Diamond Jubilee. Officially unveiled in London, U.K. on June 6, 2012, the portrait, which now hangs in Rideau Hall, contains details that represent Her Majesty’s ties with Canada. The Queen is shown wearing her Canadian honours, with her hand resting near a copy of the British North America Act, 1867. The flag behind establishes a red and white colour scheme that repeats in the flowers, medals and carpet. Through the archway behind Her Majesty stands a 1838 portrait of Queen Victoria in her coronation robes, a copy of which graces the Governor General’s residence.